Yababa World™: Donnie Darko - Trending on Twitter! Thought I'd Let You Know! Donnie Darko - Trending on Twitter! Thought I'd Let You Know! 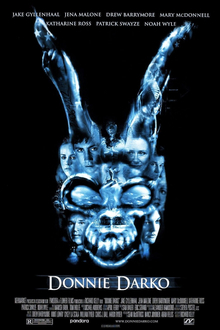 Since cult classic film Donnie Darko is trending on Twitter today world wide, I decided to release a short blog post concerning the 2001 trailer released as a threaterical promotional for the movie. I'm aware of a few people in my walking life that haven't seen the film and I must say - "it's pretty weird". I kind of get the weird feeling that a few people like it because they understand the 35mm 'masterpiece' in it's entirity, some don't understand it at all while the others just want to fit in some bad they pretend to like it(seems to be most of the people on Twitter®). Let's just hope the followers of the film don't get too crazy and start bashing people that disagree with them like fan-boys(and girls) of Apple Inc. and the corporation's intensely popular MAC®. One thing a few people can most definitely agree upon is the creepy bunny costume on the cover of the film's promotional poster.